The festivals in Thailand are celebrated with gusto and may make or break your trip, depending on the timing. Nothing is worse than just missing a big event, hearing about it, and dealing with the crowds rather than getting to enjoy the festival. Although technically two separate holidays, Loi Krathong and Yi Peng are typically combined into one visually spectacular festival of fire and light. Thousands of flame-powered Chinese lanterns are released into the air and appear as new stars in the night sky. Meanwhile, thousands of tiny boats with burning candles are released on the river in Chiang Mai as continuous fireworks boom overhead. With both the river and sky literally on fire, the visual effect is stunning! Lanterns are hung throughout the city, special ceremonies take place at temples, and a large procession parades through the streets of Chiang Mai; Loi Krathong is one of the most enjoyed festivals in Thailand. When: Loi Krathong takes place in November. Dates change because the festival is based on the lunar calendar. Where: Being a Lanna holiday, Loi Krathong and Yi Peng are best experienced in Northern Thailand, either in Chiang Mai, Chiang Rai, or in small villages outside of Chiang Mai such as Mae Cho. Songkran, the Thai new year and water festival, is celebrated by throwing buckets of water on friends and strangers in good-natured fun. Many revelers buy big water cannons and fight it out in the streets in wet, wild, dancing mayhem. The streets of Chiang Mai shut down for several days of dancing and water throwing; water is provided by the moat around the Old City. You'll probably be drenched within minutes of leaving your hotel, so waterproof your belongings and arm yourself with a bucket; no one is allowed to stay dry! Where: Songkran is celebrated to some extent throughout Thailand, however, the epicenter is Chiang Mai. One of the most bizarre festivals in Thailand, don't think for a minute that the Phuket Vegetarian Festival is about discussing the finer points of tofu. Participants willingly pierce their faces with daggers or skewers, walk on hot coals, and lie on beds of knives. Firecrackers, chanting, and a dancing throng in the streets add to the chaos as volunteers perform acts of self-mutilation. Amazingly, the devotees claim that they feel little pain and even their wounds heal quickly after the festival. When: Between September and October; dates change based upon the Chinese lunar calendar. Where: The island of Phuket, Thailand. Some celebrations take place in Bangkok. You certainly don't have to go to China to enjoy a massive Chinese New Year celebration. With residents and influences from all over, Thailand gets to bring in the new year with three distinct holidays: January 1st, the Thai new year during Songkran, and the Chinese New Year. The Chinese New Year hits big in Chinatown, Bangkok, with fireworks, parades, lion dances, and special foods. When: Dates change annually, but Chinese New Year usually falls in January or February. 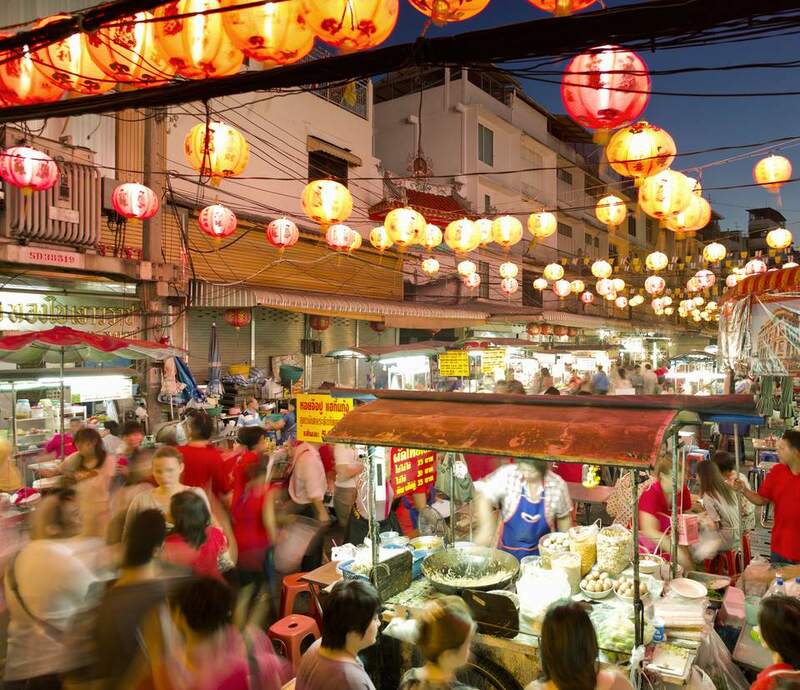 Where: Chinese New Year is celebrated throughout Thailand, but the epicenter is in Bangkok's Chinatown. What started decades ago supposedly as a small party among friends has morphed into possibly the largest beach party in the world. As many as 30,000 people or more descend on one beach in the Thai islands each month to dance, play with fire, and live out hedonistic fantasies under a full moon. The mayhem has to be seen to be believed. The insane parties have become a rite of passage for backpackers moving along the Banana Pancake Trail through Southeast Asia. Full Moon Parties have grown so popular that Haad Rin can't even accommodate everyone; many partygoers sleep in the sand or stay on nearby islands. Now the area stays busy with parties celebrating nearly every phase of the moon. When: On the night of the full moon, every month of the year. Many Buddhist holidays coincide with the full moon, so the party date is adjusted. See Full Moon Party dates. Where: Haad Rin on the island of Koh Phangan, in the Gulf of Thailand. King Bhumibol Adulyadej was the longest-reigning monarch in the world before his death in 2016. The king was loved in Thailand; his death kicked off a year-long national mourning period in Thailand. His birthday remained as Father's Day, meanwhile, the King's Birthday celebration moved to July 28. King Maha Vajiralongkorn succeeded his father as the new King of Thailand. His birthday is a patriotic event to be celebrated annually with fireworks, acts of good deeds, and processions. The Queen of Thailand, Sirikit Kitiyakara, is just as loved by the Thai people. She is the world's longest-serving consort to a monarch. Special festivities mark her birthday each year.